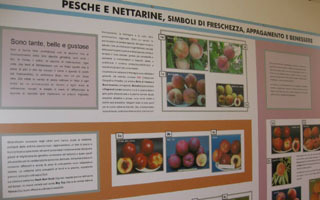 Adjacent to the peasant farmer’s kitchen is an exhibit and workshop area on the cultivation of fruit trees in the Emilia-Romagna Region. Developed in collaboration with the Department of Arboriculture of the University of Bologna and the Institute for Cultural, Artistic and Natural Works (IBACN) of Emilia-Romagna, this section includes the teaching documents of Professor Angelo Manaresi (1881-1973), attesting to the dissemination of the discipline both at the university and in satellite schools in the field. Workshops offer school visitors and families the opportunity to take part in guided tastings where they learn to recognize local fruits, seeds and plants of origin, discovering the history of each along the way.